ALL MEMBERS PLEASE NOTE: As of today, you must be current on your membership dues for 2018 and 2019 in order to proceed past Stage 1 in the NACA process. 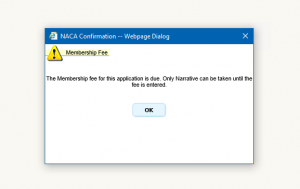 A block presently is in place on all NACA Purchase Program files for which dues have not been paid through 2019. Membership dues must be collected every calendar year, so 2019 dues must be collected for all Members, regardless of when they paid their 2018 dues or joined NACA. If you still have questions, please contact NACA Member Services at 425-602-6222.